You must make reservations at least 5 minutes in advance of the time at Ultreia. Street and off-street parking is available throughout Lower Downtown. Valet parking is directly in front of Denver Union Station. 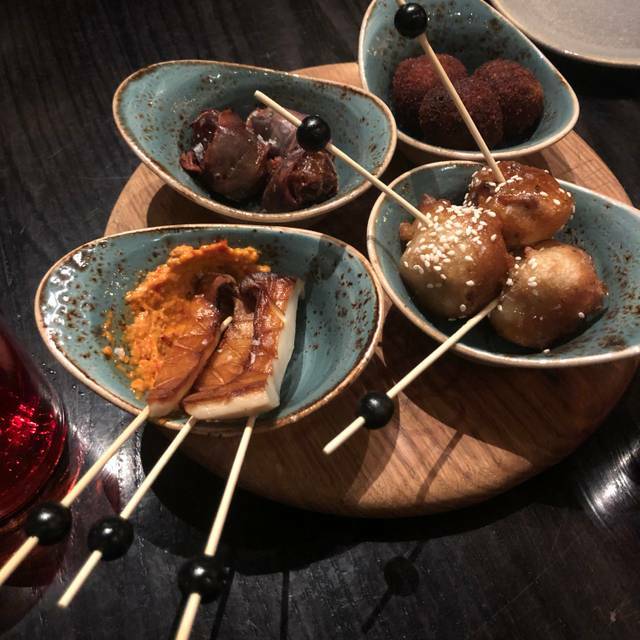 We are a Spanish and Portuguese restaurant with a lively atmosphere, serving plates from the Iberian Peninsula that are meant to be shared. Gin tonics and sherry adorn the cocktail menu along with Basque ciders. Spanish & Portuguese food specials on offer to celebrate the most special lady in your life! Our server was a delight with her warm welcome and a smile. She accommodated us by warming up the tuna peppers a bit. They and the mussels were delicious. Thanks for a relaxing dinner. Thank you! We are glad you enjoyed your meal at Ultreia. Every time I go to Denver, I eat at Ultreia. It's one of my favorite restaurants anywhere. They have great gin cocktails, plus a long list of sherries, and so many other wines by the glass it's really hard to know where to start. The small plates are wonderful, you feel like you're in Spain with a mouthful of anchovy, olive, and pepper. It's a great place to sit at the bar and try several little plates. The food is simple, made from high-quality ingredients, very Spanish with its cheese selection and charcuterie. I love the atmosphere with high ceilings and Victorian-style wall paintings. Knowledgeable staff. I usually come to Denver when my husband is at a convention and eating with clients, so this is a place I feel comfortable coming to alone and sitting at the bar. Not inexpensive, for sure, but if you're going to spend some money, do it right. The acoustics are difficult--I made friends with the people sitting next to me at the bar but couldn't hear a darn thing they said without shouting. Why not figure out some baffling on the ceiling or something--that is one loud box! The food is good, the gin & tonics are wonderful but the smell is awful. It’s smoky and there isn’t good ventilation. I was wearing a leather jacket and now it smells of fried fish. In the summer you can sit outside which takes care of the smell issue but in the winter don’t go wearing anything that you can’t wash easily. Short notice birthday dinner...could not have been more perfect. The fun and tonics are the best! Alan is a gracious host. And the service is top notch! We go back often! Thanks for choosing us for your birthday celebration! We are so glad you enjoyed it. Very good value, beautiful interior walls and space. Thanks for writing! We are so glad you enjoyed your meal. I was pleasantly surprised that we waited very little time to get into the restaurant. The service was very good. The food that we ordered was very good but the menu was limited. I wished the menu had had more tapas options but what they did have was very good. Unfortunately this was a disappointment. Had heard good reviews, however the food fell short of expectations. Do not order the chorizo. Waitress was very pleasant though and the wine was decent. Really bad service from seating experience to waitstaff.